Journal of the Historical and Archaeological Association of Ireland (later JRSAI), Series 3, part 2, 1869. "Unpublished Geraldine documents. No.1. 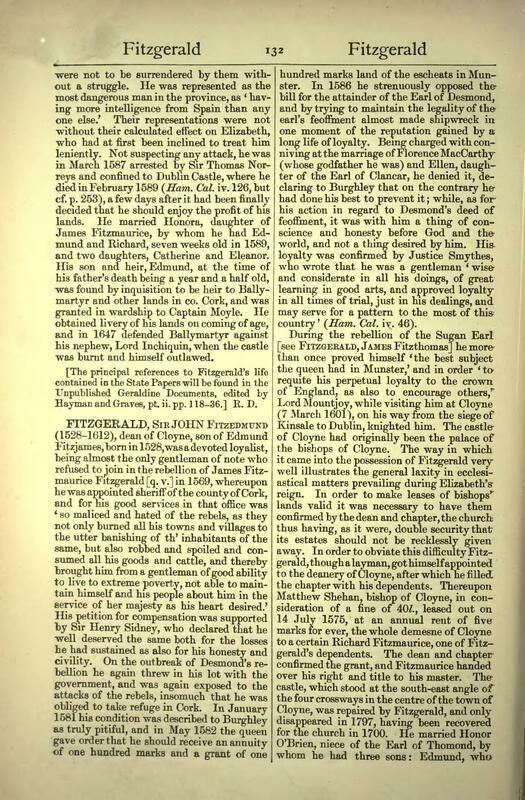 Russell's 'Relation of the FitzGeralds of Ireland'", by Rev. Samuel Hayman, pp.356-416. "Unpublished Geraldine documents. No.2. The Earls of Desmond", by Rev. James Graves, pp.459-498. Appendix, by Daniel MacCarthy, pp.499-559. 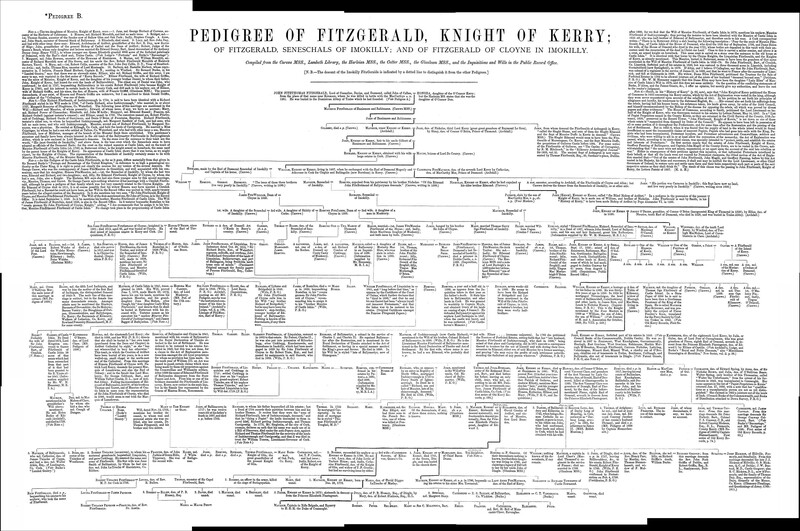 See "Pedigree B" and more detailed "Pedigree B" stitched together from multiple scans. John Fitzedmund Fitzgerald in [DNB, 1885-1900 edn, vol.19]. See p.131 (see transcript) and p.132 (see transcript). mar Honora FitzMaurice Fitzgerald [dau of the rebel leader James FitzMaurice Fitzgerald]. He was the last Seneschal of Imokilly. Leading rebel in the Desmond Rebellions. Ally of Honora's father James FitzMaurice. He went with James FitzMaurice to France in 1575. He joined James FitzMaurice in rebellion again in 1579. 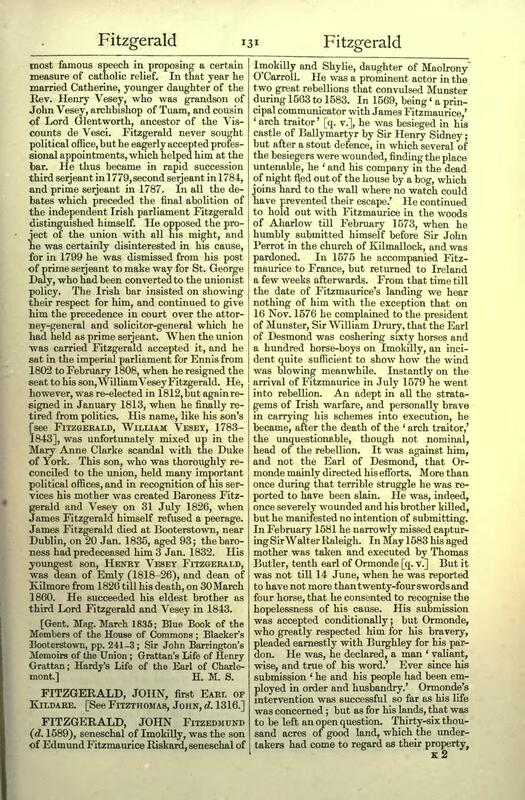 Leader of the rebellion after James FitzMaurice's death in 1579. He died a prisoner in Dublin Castle in Feb 1589. 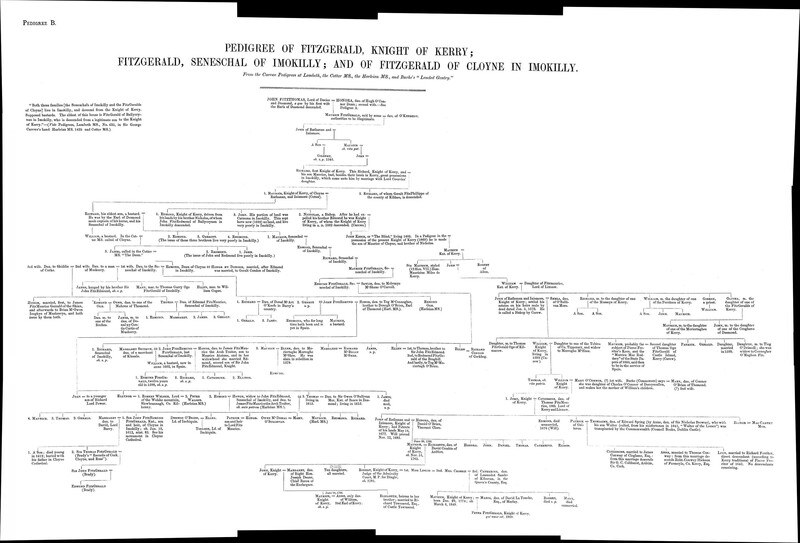 Honora re-married, and by her 2nd marriage was ancestor of Elizabeth II. 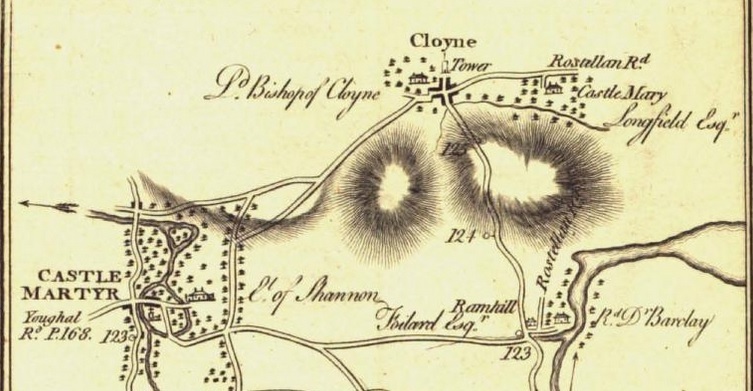 Cloyne on p.126 of [Taylor and Skinner, 1777]. The building shown would be Cloyne Castle (the Bishop's Palace).